Drawers of corn in many colors and stacks of pungent juniper - the Walter B. McDougall Herbarium is a dried garden holding important knowledge for researchers seeking to understand a changing environment. The herbarium began in August 1928, when Dr. Harold Colton donated a “nucleus collection of flowers for the herbarium.” There’s no indication whether the flowers were already pressed flat or brought as a fresh-picked bouquet. Either way, the small collection has grown through the years to more than 40,000 specimens. Most valuable, many of the specimens come with ethnobotanical notes about their traditional names and uses, from absorbent bark used to pad cradleboards to leaves purportedly used as poisons. Sometimes plants are also stored as they would have been in an ancient pantry, such as the cantaloupe melon, which is dried in strips and wrapped around itself in an early version of a fruit rollup. The herbarium contains the collections of many early ethnobotanists, including Al Whiting, Grenville Goodwin, and Louisa Wetherill. Wetherill spoke Navajo and would go on walks with a Navajo traditional healer, Wolfkiller. On their walks they collected plants and Wolfkiller would tell Wetherill their uses. For the past few years Phillips has been processing the backlogged herbarium specimens through a grant from the Institute of Museum and Library Services. As she matches historic plant specimens to their ethnobotanical notes, Phillips discovers new plants and fascinating tales. One of these was a plant originally collected by Museum of Northern Arizona researchers in 1979. At the time, the researchers recognized it was in the Mentzelia genus, but did not know what species it was. 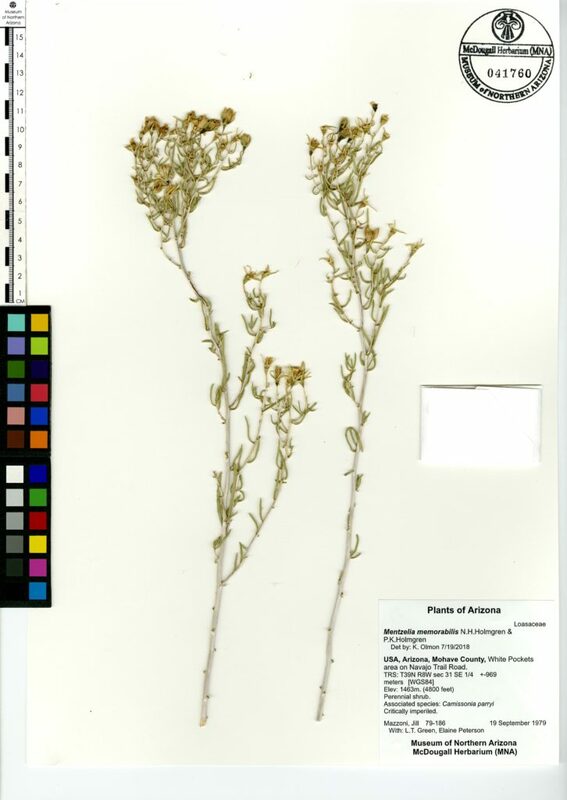 Recently Phillips identified the specimen as Mentzelia memorabilis, a species unknown to science when it was found in 1979. The species was not named until 2002, after other researchers discovered it when they found themselves stuck in Salt Lake City after the 9/11 terrorist attack. 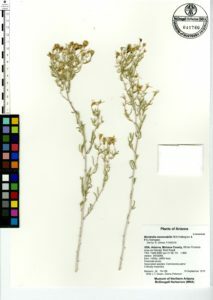 While stuck in Salt Lake City, Noel Holmgren and Patricia Holmgren discovered specimens of an unnamed species of Mentzelia in the Stanley L. Welsh Herbarium at Brigham Young University that looked different. They decided to visit the place where the plants were collected—a small area on the Arizona strip and just beyond across the Arizona-Utah border. This is the only place this plant occurs and it is considered critically imperiled. MNA researchers continue adding to the herbarium, from plants Dr. Larry Stevens finds growing near the remote springs he studies to galls Dr. Gary Alpert collects as he investigates arthropods. With the advent of affordable DNA sequencing, this growing repository of plant diversity will continue to produce new and valuable information. It may also someday be the seed for a new garden of old varieties. “There’s an opportunity for saving extinct plants by going back to the herbarium sheets and using seeds,” said Phillips. Phillips will lead a Behind-the-Scenes Botany tour of the herbarium on October 19. Space is limited. Go to musnaz.org for details and tickets.